I have this poem tag from Rebecca of Skippy Heart thanks for this sister. You really touch my heart when i finished reading this poem. I have always been a friendly feeling kind of gal and I do believe that true friendships can be developed over the Internet. I value my friendships whether in real life or online a lot...so when one seems to go away, for no real reason, or as soon as I notice that people who claimed to be my friend - are not really my friends...I feel hurt and at a loss. For some, Friendship is rather meaningless... but for me, like Love, it is the greatest thing any one of us has to offer. On this note, I am now offering and passing on my heart of friendship to the following bloggers and non-bloggers: Dancing with Butterfly, Dauphine, Ester, Femikey, Krung, Liza, Mari, MarieJ, Mommy's Gibble Gabbles, PrettyLifeOnline, Reaven's Heaven, Shabem, and Tere. Last night while waiting for my favorite show to start breaking news flashed on the TV screen. And boy…. 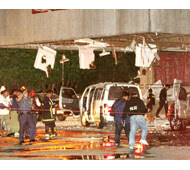 It is about the blast that happened to Batasan Pambansa. Isn’t frustrating to heard information like this? How can we deal with this blasting stuff when a few weeks ago it’s Glorietta 2. Anyway regarding this Batasan Blast it is said that a suspected car bomb exploded at the entrance lobby of the said building. This killed Basilan Rep. Wahab Akbar and a driver and wounding at least 12 others. The news said that it was Akbar who is the principal target of the bomb. Akbar, a former Abu Sayyaf member, died at the FEU hospital in Fairview. The other casualty was identified as Marcial Rualdo, driver of Gabriela party-list Rep. Luzviminda Ilagan. The two wounded congressmen were Ilagan and Negros Oriental Rep. Henry Teves. Teves’ niece Ma-an Bustalino was also reportedly injured and is in critical condition. I sometimes think what will happen to me when I get old. Does my family really take care of me? Nursing home in the Philippines is not really welcome unlike in some parts of the world. It is because of our family background. Although I really don’t believe I will be put in an institutions for those elderly folks I still sometimes think about that. What if a stuff will be accepted in my country? So a chance will always be there that I might be put in a institution like this. For sure i will ask my family to look for an institution that can be trusted and doing good in this field. Anyway I saw this site that i think have a great deal to the elderly. And for sure I will recommend this place to my friends who is now living abroad. I will see to it that they can check what's on this nursing home. In bettercaring you don’t need to worry about your elderly because they have something for you to choice from, so that your patience will be really comfortable. The elderly will really feel like they are in their own home. With them you not need to worry about your health because they will surely watch you health with their healthy living. And we know for the fact that old folks have a very sensitive feelings. We need to be extra careful on choosing where to put them in there retirement period. Bettercaring has a heart for elderly so we will be sure that our parent, friends will be treating good as if they are in there own home. You can also check about their care options because I believed they have the best. If I will be put in an institution like this for sure i will choose bettercaring.